If “subtle” is not for you, you’ll probably love Pattern Cooler. 225 different patterns are available. Each pattern can be customized. Besides offering the possibility to change all the colors individually, Pattern Cooler allows you to choose from four different sizes. If this still doesn’t suffice, Pattern Cooler lets you add a texture to the pattern. Textures are provided in textile or noise styles. Once you’ve finished your pattern, Pattern Cooler offers a download in PNG format. If you want your pattern to be high-res or even vectorized, Pattern Cooler has you covered, but will set you back 10 USD per pattern. Patternify is an excellent tool for pixel-pushers or 8bit aficionados. On a defined canvas, ranging from one to ten pixels edge length, pixels are placed. Color and transparency can be chosen freely. 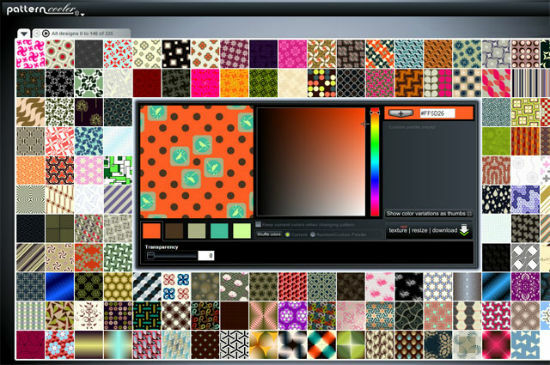 Several simple patterns can be preselected, a live-preview shows the creation in operation as a pattern. 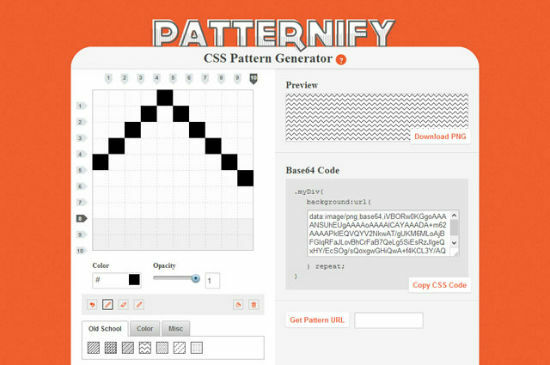 Besides offering a download in PNG format, Patternify can provide the pattern as a data URL complete with CSS code. 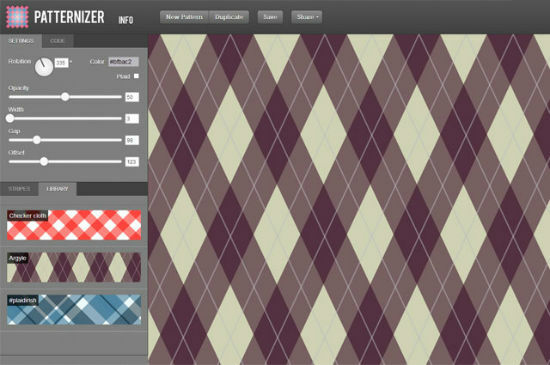 To create a pattern, stripes in various colors and widths are layered over each other, using Patternizer’s visual UI. The finished pattern is saved as a JSON object, which then, together witt the Patternizer library needs to be embedded into your HTML document. 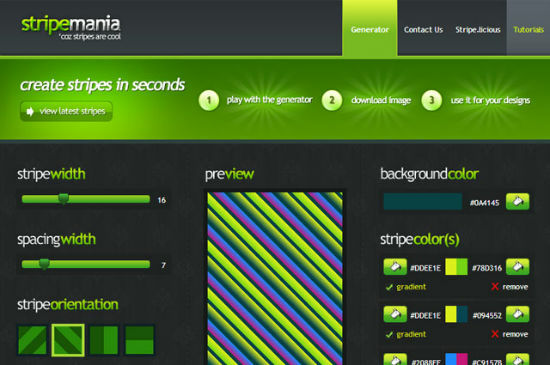 If you like striped patterns, but prefer to use them in a more conventional way, Stripemania is for you. Compared to Patternizer, possibilities are a little limited, but the major advantage is that Stripemania delivers images in GIF or PNG. You can also vary the colors on one and the same stripe, even set gradients. 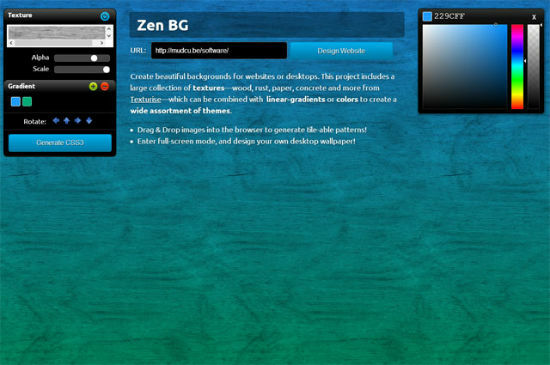 ZenBG closes our little roundup of pattern generators. ZenBG offers different textures, which can be colored ad libitum. There are wood-, stone- and paper-variants. Having chosen the desired texture, color it to your liking. If you are into versicolor, opt for more than one color and apply it as a gradient. Once finished, ZenBG lets you download a ZIP archive, containing not only the imagery but also the needed CSS.